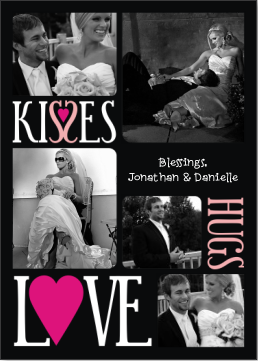 Butler, Party of 4: Hugs....Kisses....Love! I was SO crazy busy around the holidays this year that I never made it around to sending out Christmas cards. I typically send out cards with a message, but was excited to create ones this year with our pic on it like everyone else sends out- so cute, right? (It's lame to do that before you're married, so this was the first year I could actually do it!) Between work, school, church, and shopping, I didn't make it happen...and then I had an idea! My coach's wife (in college) sent out Valentine's Day cards with her kids pictures and they were adorable, so I decided that's what I'd do! Danielle, the card looks beautiful. You said they haven't arrived yet, and when they do, you will of course sign, stuff, stamp and mail them. I use an online system that does all that automatically, and it costs me much less than what I used to pay the printer, and I do it a whole lot faster, therefore, I never miss important holidays, birthdays or other events. I use it in my personal and business life. It even lets me upload pictures, my real signature, and I can make each card look like it was made for only that person, but it can be used for a single card, or, my whole Holiday card mailing list. I love my card! We thought...how sweet!